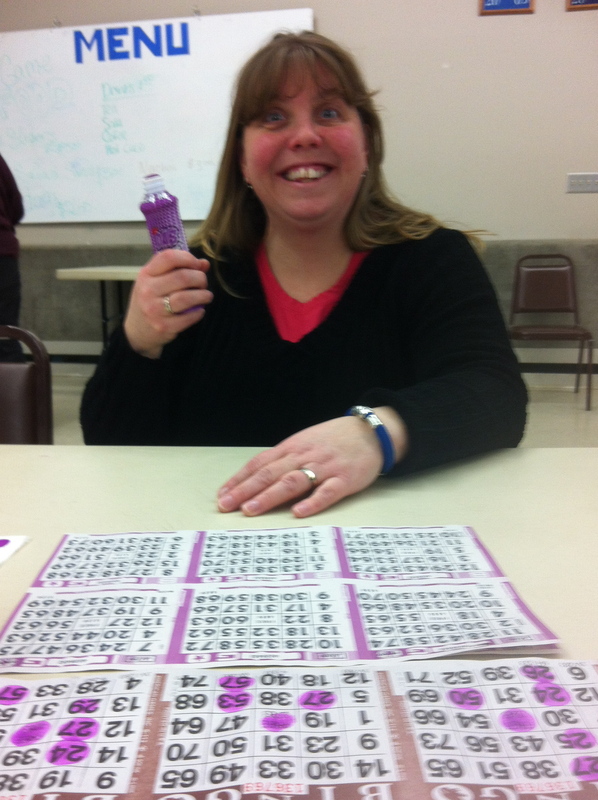 On Friday night, Michele and I decided it might be fun to go play some BINGO! Yep, Bingo. I haven’t played since I was a kid and neither one of us had any idea what we were in for. The night started off innocently enough. We arrived in a near blizzard to a packed Willow Community Center. It was the annual bingo night at the Willow Winter Carnival. An event that has been going on for 51 years. Not, bingo, I don’t suspect, but the winter carnival is a big deal in this little hamlet of about 2,500 people. We paid out 22 bucks for a packet of bingo cards and two Dab King blotter thingys that will probably leave stains from here to Sarasota, and grabbed a seat in the back of the room. Suddenly I had a weird feeling pass over me. I felt like we were in that movie, Pleasantville, starring Reece Witherspoon or maybe even that Stephen King novella, You Know they Got a Hell of a Band. It was freaky. This live and in techno-color event in this little village, or whatever they are calling it, was bordering on the bizarre and I didn’t even have a cool muscle car. The games started and we grabbed some cheap, buck-a-piece snacks and listened to a “true Alaskan” as she worked the P.A. The “Willow Queen” worked the room checking the winning cards and dolling out the cash. As I said the room was packed with what looked like a lively crowd of median 50 aged bingo blotters. But something was missing…. I didn’t see any rabbits feet, good luck trinkets, or any of those munchkin troll dolls with the weird hair. Michele and I played only two cards a piece per game. Remember we are bingo virgins here. Beside and around us people were playing so many cards that they might need the F.A.A. to keep track of all their dots. In the middle of games like snowplow, northern lights and straight bingo they paused for the real entertainment of the evening. They gave away door prizes of hamburger sliders, hot off the grill I might add, and a case of 30 weight motor oil. I have told you they do thing different in Alaska right? The lady that mans the post office was dolling out pull tabs by what looked like the hundreds and it looked like very few people were earning their money back. 1. Do you know why golfers wear two pairs of pants? In case they get a hole in one! Ha Ha Ha. 2. I got this lady an AM radio and she was upset because she wanted one that played in the afternoon! 3. Do you know why nurses carry red pens? In case they have to draw blood! I know. Don’t even comment on it. We were there till well after 10 pm and blew about 30 bucks. No bad for a cheap date night. But for some it could become a G.A. (Gambler’s Anonymous) nightmare. There was so much money flowing through that place that I am surprised Wells Fargo and Company didn’t have an armed guard manning the cash box. What do you do on your date nights with your sweetie? Great date night – loved every minute of it!